Many people today talk about justice, but are they living justly? They want to change the world, but are they being changed themselves? Eugene Cho has a confession: "I like to talk about changing the world but I don't really like to do what it takes." If this is true of the man who founded the One Day's Wages global antipoverty movement, then what must it take to act on one's ideals? Cho does not doubt the sincerity of those who want to change the world. But he fears that today's wealth of resources and opportunities could be creating "the most overrated generation in history. We have access to so much but end up doing so little." He came to see that he, too, was overrated. As Christians, Cho writes, "our calling is not simply to change the world but to be changed ourselves." In Overrated, Cho shows that it is possible to move from talk to action. 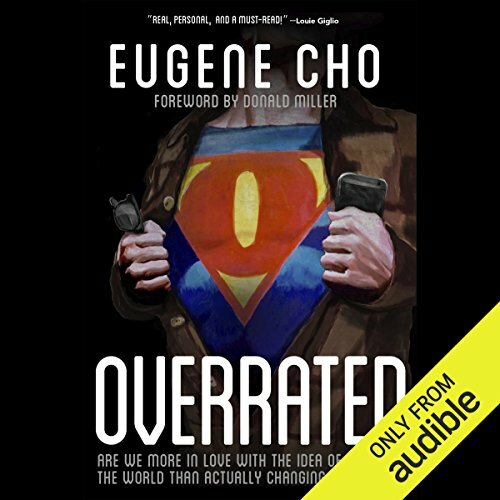 ©2014 Eugene Cho (P)2014 Audible Inc. I got this book after hearing Pastor Cho speak in person at a conference. I was intrigued and the price was right ($3.99 on sale). I enjoyed reading his autobiography and memoirs of starting Quest Church and One Days Wages. However, I felt like his message simply regurgitated the ideas of many other books I've read such as When Helping Hurts. Also, he talked about how people sacrificed and gave money to ODW and other organizations, which is good. However, he missed a large part of changing our lives to DO things that matter as well. I probably wouldn't recommend it to a friend as I think it would be a better sermon or blog post series. Eugene Cho's passionate stories about moving from wanting to doing are inspiring and life changing. This is a book that will leave you no choice but to get up and take action. This is a good book with good ideas and important things to say. The author spend perhaps a little too much time describing the problem at the expense of bringing about solutions. For example, it is important to make wise decisions in addressing complex issues. There were many, many examples of this. After a while it's starting to sound like the authors pet peeve (which it is, And should be, but this is not as helpful to readers). I would like to hear this author speak or preach on the subject more than read his material as a book. Again, there are very good and important ideas here and I am glad I finished the book. I only wish it had been given more editing. Cho hits hard in the first few chapters. Prepare for critical introspection. Prepare to have your perceptions of charity/mission work changed. Just read it and let it convict you to change your lifestyle and inspire a justice oriented view of Discipleship.